Are you tired of washlets or portable bidets that give you zero controls for the temperature of your water? Do you want an affordable device that will enhance the level of comfort that you feel without breaking your budget? With the TOTO Washlet, you’re going to get the exact experience that you want in the bathroom because you can customize the experience! It is incredibly easy to install and offers a soft closing seat to avoid slams and potential damage. Here’s the best part – you can save $300 on this washlet by shopping on Amazon! What Kind of Features Does the TOTO Washlet Have? When looking at this particular washlet, we couldn’t help but noticed how easy it is to control the volume of water you receive and the temperature the water is at. It’s a push button system that will work for a majority of users, although some with advanced arthritis may find it a bit difficult to control at times. It’s even simple enough that the kids can use the washlet functions too without much of an issue at all! the seat is also heated and comes with temperature controls as well. We really liked the contour of the seat for this washlet. There’s a definite improvement in the comfort and quality of this device! With the full coverage of the cleansing water, you’ll have a great experience every time you need to go! Are There Any Advantages That Come With This Particular Washlet? The installation process is very simple with this washlet and it will leave you 100% satisfied. Although there isn’t an air dryer on this model like some others and there isn’t a charcoal filter, you won’t notice any real odors emanating from the device. It comes with a standard wash and a soft wash so that a unique experience can be had. Although it doesn’t have a remote control, you do get full functionality and that’s ultimately what is important. You will need a GFCI outlet in order for this washlet to properly work. It’s run with corded electrical power and the cord is just over 3 feet long. That could be problematic for some users. The controls also stick out from the side of the toilet, which can make it difficult for some installations to be successful. Taller users may find some discomfort with the device as well on an individualized basis. From an overall perspective, however, the TOTO Washlet provides an excellent cleansing experience for a surprisingly affordable price. If you’re looking to upgrade to a professional quality bidet, this is definitely one of your top options available today! 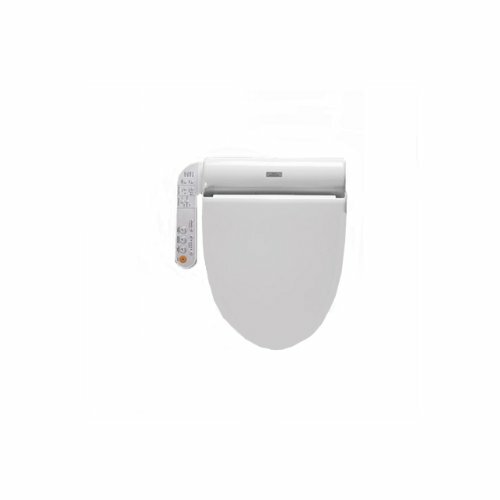 Click here to compare prices on Amazon and get the best price on the TOTO B100 Washlet.